Total 45gm oddments of light blue, dark blue and pink 8 ply wool. M = Make One. Pick up thread lying between sts and knit into the back of it. 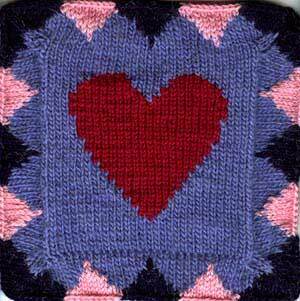 Work heart chart using the intarsia method, then work a further 5 rows st st in your background colour. Do not cast off. pick up 31sts along remaining 3 edges of square. or your yarn will not be in the correct position for the next round). Cast off neatly, sew seam on edging, and block.